WiiWare keeps on resting with VC and DSiWare action for Japanese downloaders next week. Incredibly it appears we're having a second consecutive week with no WiiWare releases in Japan, but with three more VC titles (including a much-loved Kirby release) and five DSiWare releases, it's hard to complain. Kirby Super Deluxe (800pts Super Famicom - Nintendo) -- Known in North America as Kirby Super Star and Europe as Kirby's Fun Pak, this is a Kirby game collection enjoyed by many that has recently seen a re-release on the DS. Baraduke (800pts Arcade - Namco) -- Kissy is the original Japanese space heroine pre-dating Metroid by a year. She's also the mother of Susmo Hori (a.k.a. Mr. Driller) and ex-wife of Taizoo Hori the original Dig Dug (what a family)! Baraduke (a.k.a. Alien Sector) is a side/vertical scrolling shooter in which the player walks and flies Kissy through an alien base blasting baddies on the way. The scrolling isn't forced, but players aren't able to go back once they've passed into a new area. Rescuing little rabbit-eared blobby cyclopses will give you a chance at extra hit points. It's not a brilliant game, but there's something oddly compelling about it. The little aliens saying "I'm your friend!" when you save them is much appreciated, as is their willingness to sacrifice themselves by suiciding against the boss monster at the end of every level. Bakutotsu Kijuutei (800pts Arcade - Namco) -- Subtitled Baraduke II, this is the sequel to Baraduke. It lacks some of the charm of the original, but does feature better graphics and sound and has similar gameplay. This time you control Takky (the second player in the first game), though you're still blasting the Octi Family aliens and saving the little Paccet aliens. Amakuchi! Dairoo Castle (200pts - Kawamoto Industrial) -- A seemingly simple "tower defense"-style game. Calculation 100 Renutsu (200pts - IE Institute) -- Yet another brain-training-type game from the IE Institute, this one is focused on doing maths and such. G.G. Series: Shinobi Karakuri-Den (200pts - Genterprise) -- Another little arcade-style game from Genterprise. This looks like a puzzle/platforming game with a little ninja trying to clear blocks or enemies or something -- as ninjas are wont to do. G.G. Series: Super Hero Ooga (200pts - Genterprise) -- Genterprise keeps the simple arcade action coming! This one looks like a side-scrolling beat-em-up with a guy in colourful tights. Detective Saburoo Jinguuji: Ka Dan noo Te & Nazo no Jiken Bo (500pts - Arc System Works) -- Yet another Detective Saburoo visual novel. Enjoy! I want Kirby Super Star because it's cheaper than Ultra. I wish I lived in Japan so bad because NA probably won't get this for a long time. Namco also REALLY needs to start supporting the VCA in NA. Ultra wasn't anything to get excited about, but I may get this one if it comes here. This is good news indeed. I have Ultra, but I'll still dish out $8 for the original Kirby Super Star when it comes out here. Sweet! I thought Ultra was exactly how remakes should be. It takes all that the original game had, puts it in seamlessly, and adds in even more content! ...But I still might get this one, as I am a huge fan of Kirby's golden age, and there's nothing like playing it on a TV! Wow, Japanese VC is owning the US and EU VC right now. ...as it has been for a looooong time. I already have Ultra, I'll stick with that. But I'm very happy for those who are excited about this. @Ratengo: Well, I don't keep track of the number of titles, sorry. But in this case I think Baraduke is certainly worthy of being regarded number 500. I don't care what the order is in Japanese, Baraduke is far superior to any Kirby game in my mind and therefore more deserving of the title 500th game! If you like noting the numbers more power to you, but there's no precedence on the site for doing that and I'm not about to start, thanks.
" -- as ninjas are wont to do." Sean not to be a pain in the you know; but this sounds like a typo, is it? I guess there isn't a big enough market for VC games here. WHY DOES JAPAN ALWAS GET THE GOOD NINTENDO PUBLISHED GAMES FIRST?!?!?!??!?!?!? AND WHY DO WE ALWAYS GET IT LAST?!?! !?!?!?! !?! I could never beat Baraduke....very strange game. 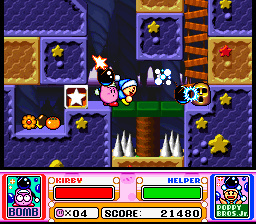 when kirby super star comes stateside, i'll finally have a decent 2-d kirby game. Baraduke is a pretty fun game, but it's a little overpriced at 800 points here. But with that said, I'm a little more interested in seeing that come up on VC than KSS, since people can easily play the superior KSSU. Why must Namco continue to leave us in the dust? Oh, and that ninja game on the DSi sounds pretty cool. @Ezekiel: No, that isn't a typo. It's just an old word almost nobody uses nowadays (and one I personally like and appreicate seeing here). Just check here for the definition. I'm relieved someone still knows the old English words I like to throw out from time to time. Look out for American slang from the 30s as well! I found a KSS cartridge at a used games store a while ago. I'm hoping it's still there! @Sean Aaron: Glad to be of service! I don't merely KNOW the word, either...I actually use it! And often have to explain its meaning. @17: Complaints like that annoy me. @StarFox: Complaints like yours annoy me. He's entitled to his opinion, y'know...and frankly, I agree with him. I just restrain myself from caps-yelling about it all the time.